The government has given the go-ahead for betting shops to open for business from 1 May next year. The move follows the introduction of the new Betting and Gaming Act. The aim is to do away with archaic, restrictive and often inconsistent laws on gambling. And from 1 January 1961 gambling for small sums will be legal for games of skill such as bridge. As the Daily Telegraph newspaper's leader writer points out: "Weekly bridge clubs, meeting in the local hotel, will no longer have to settle up in the bus shelter." And pubs will be allowed to introduce slot machines. The government hopes legalising betting shops will take gambling off the streets and end the practice of bookmakers sending "runners" to collect from punters. At the moment, anyone who wants to place a bet on the horses has to demonstrate they have enough credit to set up an account with a bookmaker and do their dealings by telephone. The Archbishop of Canterbury, Dr Geoffrey Fisher, welcomed the move as a way of bringing the gambling habits of the country under greater government control. The Home Secretary, Richard Austen Butler, has set out a timetable for the reforms. In October this year, licensing committees will be set up to consider applications from bookmakers from March and April 1961. Then from 1 May approved bookmakers issued with licences and permits from the Racecourse Betting Control Board will be allowed to take bets at "tote odds", or totalizator, when the total amount staked - after tax and administrative costs are deducted - is divided among the winners. Six months later, higher penalties for illegal street betting will be introduced. The sections of the act governing gaming and arcade machines will probably come into force as soon as this autumn. 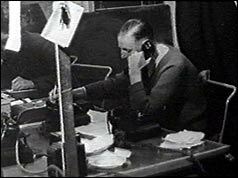 After 1 May 1961 betting shops opened at a rate of 100 a week. After six months there were already 10,000 set up. About 1,000 casinos were opened in the first five years. Two more Gaming Acts in 1963 and 1968 introduced licences for other forms of gaming. But loopholes in the law allowed almost anyone to open a casino and as a result, many of the them became a cover for criminal activity. In 1970 a new Gaming Act put far greater restrictions on all gaming, including bingo and slot machines, now subject to licence and placed under the control of the Gaming Board which answered directly to the Home Office. Gambling is now a major industry worth billions. The National Lottery was set up in 1994 while new gambling websites on the Internet allow punters to gamble 24 hours a day. In October 2004 the government introduced the Gambling Bill designed to tighten rules for betting on the internet and lift restrictions on the number of casinos.